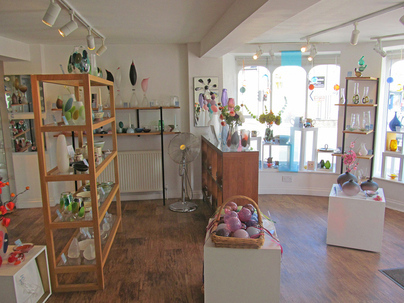 gate gallery is a small independent gallery with a clean stylish feel. The curved shop front with its total of ten large glass window panes is a stunning feature that floods the space with natural light. The gallery's primary emphasis is 'vessel' based from the utilitarian to sublime 'art' vessels. We also sell sculptural purely decorative objects and interior pieces such as decorative mirrors and hanging panels. 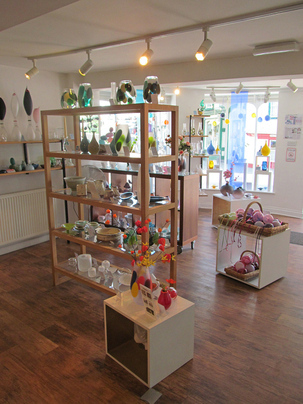 While the majority of work displayed is blown, cut, fused, cast or flat glass we do stock a small collection of ceramics, jewelery, metal and acrylic pieces as well as hand printed gift cards. 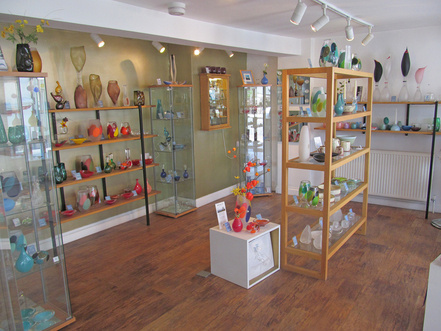 As well as the classic timeless designs that are always available the main gallery display is changed seasonally reflecting the latest trends. 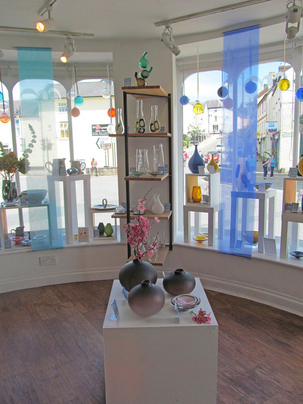 We have a rolling stable of guest applied artists/makers (see featured makers page) whose work is showcased in our stunning windows. All work displayed is available for sale or why not commission a special piece through us. The gallery space is available for hire. Please contact us for hire rates and availability. See below for basic information. There are three spotlight rails with six spot lights on each and a spot light rail in each of the three windows with three spot lights on each. Six double plug wall sockets are located around the perimeter walls with two double floor socket in the middle of the gallery.